63 percent of Americans surveyed report they would feel less connected to others if they didn’t have their computers. Almost half (48 percent) of Americans surveyed say their blood pressure rises when their outdated technology doesn’t allow them to get things done. 78 percent of Americans surveyed want to experience “bucket list” type items in virtual reality. 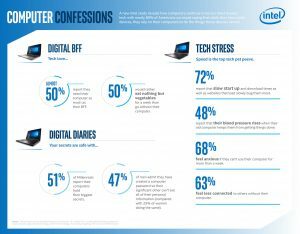 SANTA CLARA, Calif., May 18, 2017 – A new Intel survey conducted by Ipsos released today shows that computers remain the most trusted technology among consumers. Nearly 8 in 10 Americans surveyed report that even though they have other devices, they rely on their computer to do the things smartphones, tablets and other devices cannot. On average, Americans surveyed report they can go 18 days without talking to their family but only 13 days without their computer. Furthermore, computers also topped caffeine, carbs and cash, with Americans surveyed reporting they would rather go without each of these for more days than go without their computer. 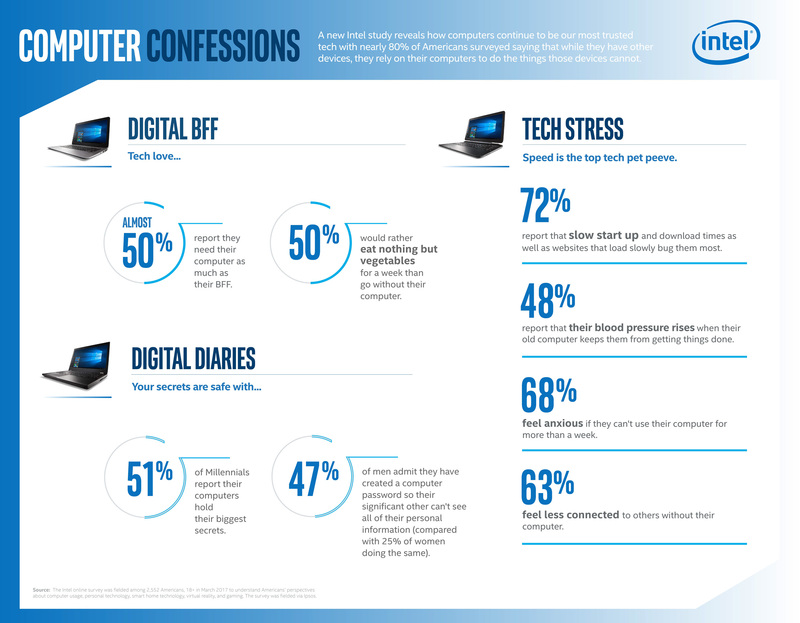 The “Intel State of Personal Technology” study examines Americans’ attitudes toward personal technology and new innovations that enable better experiences. Americans’ trust in computers can be attributed to an explosion of innovation in computing and entertainment. With ultra-high definition 4K video, immersive virtual reality, gaming, content creation, streaming and much more, today’s computers enable a significantly different experience than those from five years ago. For consumers with outdated computers, which is close to 400 million worldwide, their devices just can’t keep up, and the survey reveals the frustration – from slow load times to frozen screens. Speed is the top tech pet peeve among respondents, and 70 percent would like to be able to download content in just seconds on their computer. Almost half (47 percent) of Americans surveyed say their blood pressure rises when their outdated technology gets in the way of doing what they want. New computers powered by 7th Generation Intel® Core™ processors – from 2 in 1s to VR-ready to thin and light laptops – are faster and more responsive than ever before. They provide a dramatic difference in performance that consumers demand today, and have a long-lasting battery life and were built for next-generation immersive experiences like virtual reality. The Intel online survey was fielded among 2,552 Americans, 18+ in March 2017 to understand Americans’ perspectives about computer usage, personal technology, smart home technology, virtual reality and gaming. The survey was fielded via Ipsos.